SoundCloud is an audio platform that allows users to upload, share, and promote originally-created sounds. With over 40M users, the company has developed their community around new music discovery, especially underground songs and remixes. Designed and developed from scratch, SoundCloud’s new mobile app for iOS has a simplified visual interface and adopts a more deliberate focus on the listener’s experience. I wanted to take a look at how the redesign would affect user experience. - Explore trending music and trending audio feeds. - Search directly for tracks, artists, and other users. - Follow friends and artists to hear what they share. To test essential features, I ran a guerrilla usability test with five people in San Francisco. The requirements were that participants were new to the SoundCloud mobile app redesign, used an iPhone and had experience with music platforms like Spotify, Songza, or Pandora. With consent, I captured video and took notes on how users completed the following tasks. To avoid leading the participants in a predetermined way, I phrased the tasks as open-ended scenarios. After going through usability sessions with participants, I reviewed my videos and notes and used post-its to visually represent my findings. Next, I mapped out major pain points. One of the biggest irritations for users was discovering new music. Three out of five users went directly to selecting the Search icon, anticipating that they would be able to easily discover new music this way. Users attempted to search by genre such as “old school hip-hop” or “dance” but were frustrated that they instead were presented with songs and artists with the search term in the name. Only two users selected the Home icon and only one user selected the Stream tab to find a nested options that allowed for search by Trending or Genre. Users were anticipating further options when prompted by the call to action on the home screen, “Hear the latest tracks” and became frustrated when they couldn’t select the center of the screen. This resulted in users leaving, often returning to look for new music using Search. When looking for ways to discover new music, users often bounced from the Home screen on to other navigation areas because there was a lack of content to keep them there and no obvious calls to action to guide them to explore new music. By implementing the Trending feed as default, new users will be able to discover music more quickly and begin to populate their Stream with music they like. Create a call to action that supports music discovery on the Home screen. Another suggestion is to support a clearer call to action that facilitates music discovery. Four out of five users were unable to find options to search by Trending or Genre, as these options were nested within the Stream tab. Users did not know how to interact with the home screen and bounced. 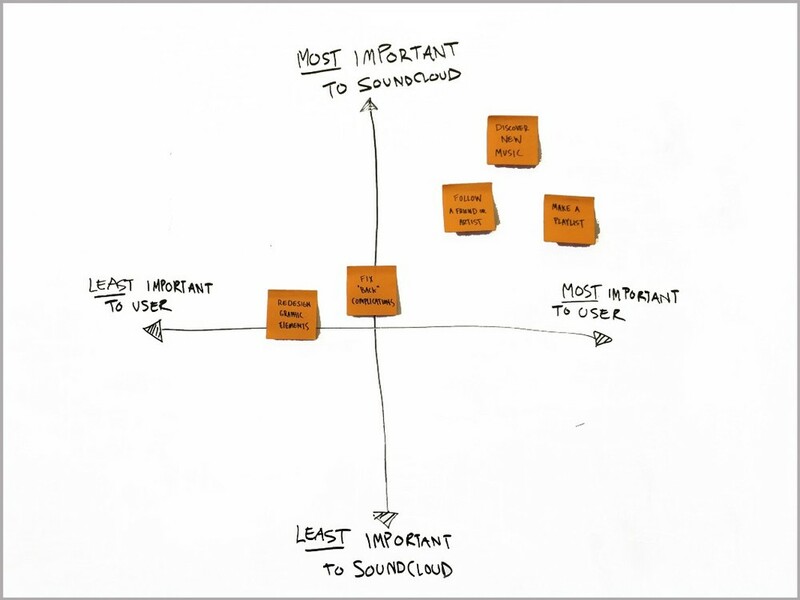 By adding a clear call to action, users can more easily discover more music. Not one user was able to locate where to follow artists. It was common for users to select the More tab, anticipating the option to follow. After being frustrated here, some users explored other areas of the navigation. Three of the five participants resorted to just liking the song. Users didn’t realize that the artist and title of the song on the music player page were actually buttons and that they would lead to the Artist’s page and an option to follow the artist. Users expected to find a button to follow artists directly from the media player screen — and this makes sense. You can like a song, so how about we add a button to follow artists, too? After seeing that there was no clear way to follow artists from the media player screen, users resorted to the More tab hoping to find a follow button. We can anticipate this move and add a follow button here. Perhaps the biggest frustration for users was the inability to create a playlist in the app. It is possible to make a collection of songs by Liking them but users didn’t find this method appealing. Currently SoundCloud’s mobile app doesn’t have the feature to create a playlist but it was clear from users that they should. Users opened the “More” tab hoping to find an “Add to Playlist” button and were disappointed when they couldn’t fulfill this task. We can easily solve this frustration by adding an “Add to Playlist” button here. Users often touched different areas of the “You” screen, choosing various gestures from tapping, holding, or flicking the screen in hopes to activate the playlist area. Considering that users were anticipating interaction in this area, we could provide a feature to allow them to drag their “Like”d music into their playlists. This would not only be a solution that plays on current user intuition but also could have the potential to delight. Finally, we could give the users what they want: a full feature to create playlists directly from the app. Using a simple design pattern, this will allow users to make curated playlists easily, right from the app. Problem solved. These suggestions are based on my observations with the intent to make the SoundCloud iOS experience even more intuitive and delightful. I would love the opportunity to validate some of the patterns I encountered and test my suggestions. Next steps would be to prototype, iterate, test, and repeat! I’m not affiliated with SoundCloud. This review is put forth unsolicited, in an effort to create value for music lovers and SoundCloud.